The FNCA has received hundreds of love letters over the years. Here is just a small sample in chronological order. I pretended I was really there in the flesh as well as in spirit. I have eaten breakfast with you, attended the lectures, enjoyed those good dinners, and listened to the talks and laughter. I have rested and visited with you individually. Together we have watched the sunsets and walked under the stars in the moonlight. On Sundays, I have sat with you in the dear little Fryeburg church. And on Wednesdays, I've gone on lovely drives through the White Mountains and picnicked with you. May and I send greetings. Directly and indirectly we have learned that you were at first smaller in number, but being very good. That everything was going well, and that you were having such a good time that you did not care whether we were there or not. Of course we are thinking of you and wishing we were there - and hoping that everything well be joyous, happy and peaceful. If the young people are as sweet, and the older ones are as nice as they were last year - don't let us know, as we are breaking our hearts to be there anyway. Thanks to all for one of the happiest vacations we have ever had. Thank you very much for your lovely letter written at the request of the Women's Auxiliary of the Assembly. I so much enjoyed knowing that it had been so quickly organized to start this summer's work. My greetings go to each one and please tell them that I am counting on being with them all next summer if I again have the use of my two legs. I want very much to send a small check to the table for I was not able to make any thing for it. As I am not sure who the treasurer is this year, may I have it made to you so that you can pass it over to the right treasurer? I cannot tell you how much I am enjoying the letters and messages that are coming from Fryeburg now - Thank you all so much. All the friends here now know of Fryeburg - have seen pictures of it and see the pictures of Laura's and my cabin up there that Mrs. Foster painted last summer and that now hangs in my room here - and they have heard of the happy times there. To all Fryeburgites -- big + little + in-between! Heartiest greetings and best wishes for a most successful 25th Anniversary Session. We are thinking of you in your customary activities as the days go by and wish we were there to have our part in them. Many, many thanks for the greeting to us from so many of you in the beautiful Assembly at Fryeburg,— and to the Bateses who seem to have begun the message from Milton in Massachusetts. We have thought of you and talked about you often here, in Baltimore, where we have stayed all Summer— of the mountains, the Saco at your feet, the village, but most of all the friends united in common worship and meditation under the pines and in the Church and the assembly rooms. We have even thought of the baked beans on Saturday night, as if we were true New Englanders! We know that you have had a profitable and rewarding session, now drawing to a close. Our best wishes and thanks to all of you, including "Lill and May", to whom a copy of this letter goes. "We who have an intimate, present interest in the progress of the Assembly find ourselves the proud owners of a beautiful plot of ground and a group of buildings. But if that were all we had, we would be poor indeed. Our real wealth lies in the experience, the tradition, and the examples of service and self-sacrifice which have been handed down to us. The history of the Assembly is our inspiration; its future is what we make it." "In gladness we remember the happy experience we had there. May everyone who has to stay away or depart once like we now have to, be never apart from her in spirit like we ourselves shall never be." 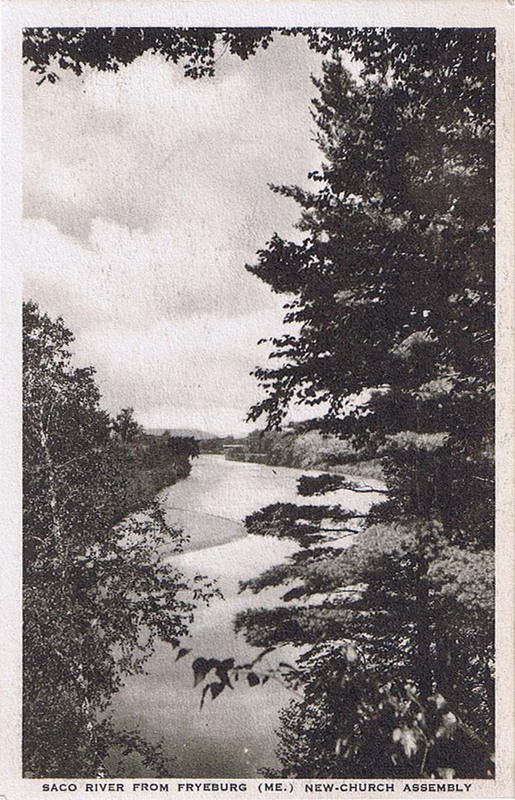 "I am enclosing two sheets that Edwin was working on about Fryeburg. I do not know which one he worked on first, but it looks like he was working toward a final paper to send to the Messenger. Also some pictures from those years. Please understand, this was worked on at a time when he was declining and there are many spelling and grammar errors, which was not Edwin as he was a Harvard Language major. He would have had me edit it for him before he submitted it to the Messenger but he didn't reach that stage when he passed away. The pictures he mentions, I gave to the Rev. 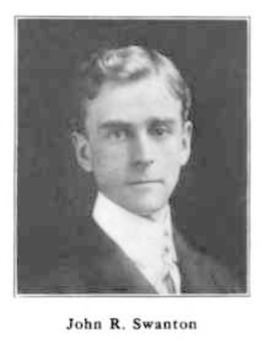 Dr. James Lawrence [current SHS dean] before I found these pages. The Swedenborg House of Studies in Berkeley CA has set up an archive in Edwin's name and he may have put them there. I really don't know. 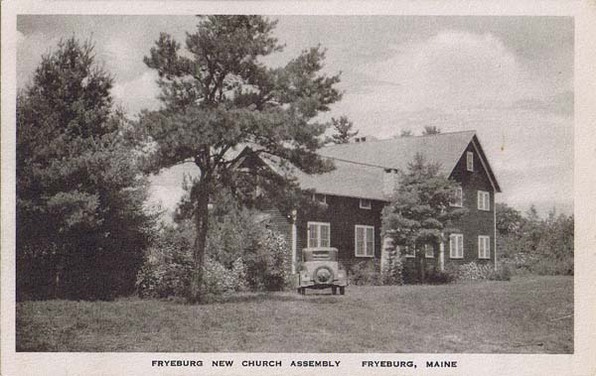 I just know that Edwin would have wanted the Fryeburg Assembly to know about the history of the Camp." Following the Civil War, northern New England became very popular for summer visitors. This included Fryeburg. My grandfather, Robert Capon, visited there in 1889, and seems to have been thinking of returning in 1890, for I have a letter dated 1890 giving him information about two boarding houses in that town. At the time, he was living in Montreal, which had good train service to Maine and New Hampshire. How often he and his wife came to Fryeburg, I do not know. But he and his wife and youngest son are in the group picture of those attending the Assembly in 1933. My grandparents are in the group picture of those attending the Assembly in 1936, too. 1936 was also my first year at the FNCA, though only for two or three days. Fortunately, one of those was an Outing Day, and I was welcomed to go with a group of Flames in a climb up South Baldface Mtn. in Chatham, New Hampshire. The only ones in the group I recall were John and Louise Swanton who took turns carrying their baby. (30 years later, the theological school moved to within two blocks of the Swanton's, who were helpful in getting the neighborhood to accept us.) We never did get to the summit that day, but we did get above treeline and had a great view over Fryeburg towards Mount Pleasant. From this experience, I became a frequent mountain climber. In those days, the Assembly was held for three weeks. The next four years, I spent either two or three weeks at the Assembly. I waited on tables to help with my expenses. Waiters had our own table in a corner of the kitchen. The first Outing Day of each session was set aside for what we called "Round River", an all-day canoe trip down the Saco River. 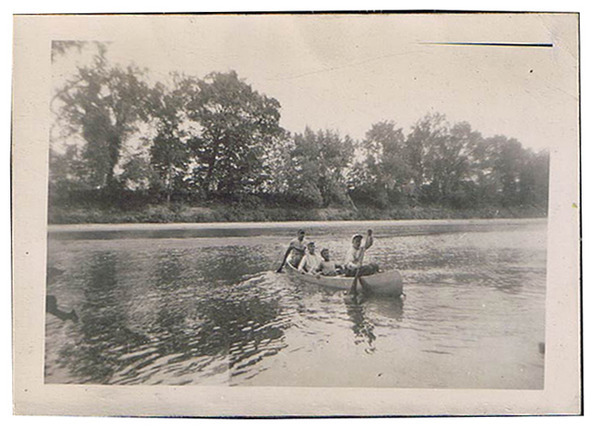 Today, the river is so crowded that canoes run into one another; but in those days, we sometimes ran into skinny-dippers. I don't know when the dorm for the boys was built, but it was fun to sleep in Army pyramid tents. Some nights were cold, but some were warm enough to bring out the mosquitoes and citronella. I particularly enjoyed the freight trains that went by about 4:00 a.m. every night. The ground seemed to shake. But the tracks have been silent now for some years. I enjoyed having the Sunday evening worship in the Fryeburg New Church. Nowhere else have I participated in a 1912 service for Sunday evening: we chanted the Magnificat instead of the Benedictus. I still remember the tune for it. Many of us would walk to and from that service.